You will most commonly find Smokey these days in the Museum’s workshops, beavering away on the Catalina. Although he’s only been volunteering with us since 2013, his association with the Museum, and with the Catalina in particular, goes back much further. Smokey joined the Royal New Zealand Air Force as a boy entrant in 1963. He had an eventful career as an airframe fitter, working on the Bristol Freighter, DC-6 and Hastings, through to the C-130 Hercules. He travelled to England in 1976 to undergo training on Andover maintenance, and returned as an instructor. He also worked on the first C-130 fuselage upgrade, and had visits to the Lockheed Corporation and Robins Air Force Base in the US, and Northwest Industries in Canada. Smokey received a Chief of Air Staff Commendation in 1987, and finished up in 1989 as a Warrant Officer at Pilot Training School at Wigram. He then did another 22 years’ service with Air New Zealand, working on the Friendship, Boeing 737 and C-130. Smokey’s first contact with the Air Force Museum began when he was still in the Air Force in the mid-1980s. 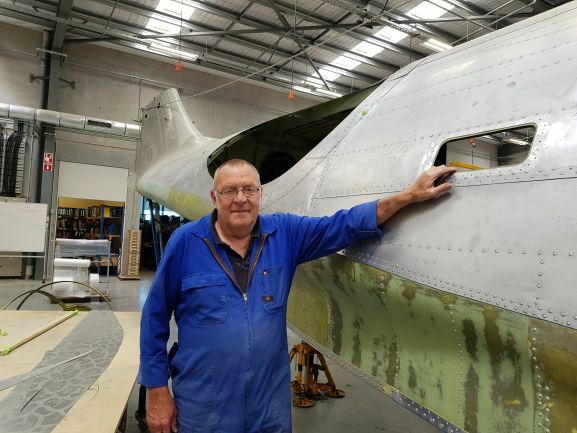 He worked on the original restoration-rebuild of the Catalina at Whenuapai in 1984-1988 and was also part of the team that brought the Dauntless wreck back from the Pacific in 1988. Further to this, he would frequently collect collections donations on behalf of the Museum from around the Auckland area. A former competitive darts player and rugby coach, Smokey tends to spend his down time these days visiting his daughter on her farm at Amberley, doing Sudoku puzzles and watching a bit of TV. His favourite film, for the record, is the ‘Sound of Music’! Ray Sheridan began volunteering with us as a guide in 2015, motivated in part by an interest in aircraft, but also a family association – he has a granddaughter who is a medic in the Air Force, currently based at Woodbourne. Ray is no stranger to military ways himself, having done three years’ National Service with the Army in the early 1960s. He served with the Artillery, and spent some time in Waiouru before being posted down to Canterbury with 32 Battery, 3rd Field Regiment. Most of his working life, however, has been spent in accounting and business administration, with the last 25 being in the IT sector. Having been born and raised on farms in Canterbury, Ray never strayed far from rural life, employing his skills in the dairy and meat producing industries, and later, with an agricultural wire manufacturing company. Since his retirement, he has enjoyed finding new ways to keep busy and maintain social interaction with people. As well as volunteering with us, he also donates his time (together with his wife) to Age Concern. He drives a van for them, picking up older people and taking them to a host for morning tea, then bringing them back home – valuable interaction for people who otherwise may be quite isolated. When he’s not busy volunteering, Ray enjoys gardening, walking, and family time. He doesn’t claim to be a big “movie person”, but is partial to Mark Knopfler’s music. 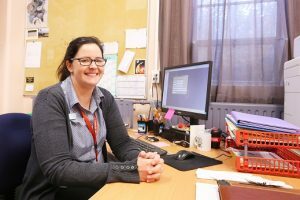 Sam McKinnon has been our Exhibitions Designer for a little over two years now, having come to us from Canterbury Museum where she previously worked as an Exhibitions Technician. As her job title suggests, it is Sam who is the creative talent behind our exhibitions and displays. Sam McKinnon is just as happy in overalls installing new displays as she is sitting behind a computer screen designing them. Sam has been our Exhibitions Designer for a little over two years now, having come to us from Canterbury Museum where she previously worked as an Exhibitions Technician. As her job title suggests, it is Sam who is the creative talent behind our exhibitions and displays – from simple interpretive panels to complete exhibitions such as ‘War in the Air’. Sam says it’s the unique challenge of bringing together an exhibition with objects of such hugely varying sizes – literally from button badges to aircraft – that is the thing she enjoys most about her job here. In a former life, Sam spent six years on the road as a bus tour guide for Contiki, showing people (mostly 18-35 year olds) around Europe. In her spare time these days, she is heavily involved with local theatre companies. She is a regular performer, and says she prefers acting, but is also happy singing and dancing. As a self-professed thespian, it is perhaps unsurprising that her favourite film is in fact a musical – ‘Rent’, closely followed by ‘Chess’. After a lifetime spent ‘playing with aeroplanes’, volunteering in the technical section here at the Air Force Museum seemed a natural way for Ron Reeve to spend his retirement. Ron started out with NAC as an aircraft maintenance engineering apprentice in 1965. By an incredible coincidence, the first aircraft he worked on was Dakota NZ3551, now in the Aircraft Hall (NAC did some aircraft servicing back then for the RNZAF). It’s perhaps no surprise, then, that this is his favourite thing in the Museum - ‘I just love that aeroplane’, he says. 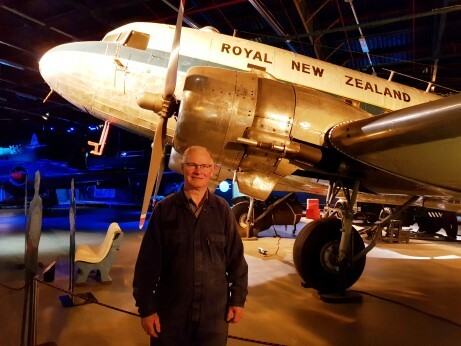 Ron’s time with NAC and Air New Zealand took him from heavy maintenance as an aircraft mechanic, to stints as an inspector on propeller overhauls, maintenance forward planning, technical services, publications, structural repair, aircraft systems, and engine and component management. He managed the engine fleet for Air New Zealand national and Mt Cook Airline, with a budget of around $10 million annually, and was the project leader for the exit of the Boeing 737-200 fleet. Ron left Air New Zealand in 2002, 37 years to the day after he joined. A period as a technical rep for three different aircraft leasing companies followed, and he spent eight years travelling all over the world looking after the redelivery of aircraft from sale to end of lease, and some repossessions. After getting tired of ‘living out of a suitcase’, Ron got a contract with a company in Denver, Colorado, reporting on aircraft engine conditions and histories, before finally retiring five years ago. All up, Ron has spent 50 years ‘playing with aeroplanes’; he calls it ‘playing’, he says, because he enjoys it so much. His passion for aviation is what led him to start volunteering here nearly three years ago, prompted by conversations with Trust Board member and long-time associate, John Mounce. The things he loves most about working in the tech section is ‘being around old aeroplanes and a great bunch of people.’ He has also really enjoyed getting to work with the Gateway aviation students, and mentoring a new generation of potential aircraft engineers. When he’s not at the Museum playing with aeroplanes, Ron may be found pursuing his other love – old Jaguar cars. He is President of the Christchurch Jaguar Drivers’ Club, and is currently restoring a 1955 Jaguar XK140. And apparently he doesn’t really have a favourite film, but does enjoy watching Antiques Roadshow! Hans Nagelkerke hails from the Netherlands, where he did a period of service in the Dutch Air Force, beginning as an assistant engineer and finishing up as a crew chief on the Lockheed F-104 Starfighter. When he left the military, the job market in the Netherlands was not all that positive, so following recommendations from family already in New Zealand, he emigrated in 1981. Back then, jobs in the aeronautical industry were hard to come by in New Zealand, so he moved instead into nautical engineering, and worked for 2.5 years as a marine engineer in Lyttelton. After a stint as the chief engineer for a printing company, Hans finally got back into aviation, when he landed a job as an engineer with Air New Zealand in 1989. There he stayed for the next 26 years, although only the first six were spent as a ‘hands-on’ engineer, the rest was in planning, etc. He was a member of the team that worked on the exit of the Boeing 737 fleet, which was led by fellow Museum volunteer Ron Reeve. Hans’ involvement in aviation was not limited to the workplace. During the 1980s he helped build a single-seater aircraft which he later flew, having obtained his pilot’s licence in 1991. He used to take part in flying days here at Wigram, with former Air Force Museum Director, Dave Provan. In another connection with Wigram, Hans was also an active member of the Pegasus Land Yacht Club, which used the airfield once a month in the early 1980s, and held 24-hour races here for the Telethon fundraisers in 1982-83. Having retired nearly three years ago, Hans began volunteering here at the Museum in April this year, encouraged by his uncle and former guide, Peter Wynands. When Peter decided it was time to retire from guiding, it seemed an ideal solution for Hans to take his place. When asked what he enjoys most about being a guide, Hans answered without hesitation, ‘The interaction with people.’ He enjoys being able to bring a different perspective, particularly being able to speak to Dutch and German visitors. His favourite thing in the Museum is the Schleicher Ka-4 glider, as he did his first solo flight in the Ka-7 model, before going on to do over 400 hours in gliders. 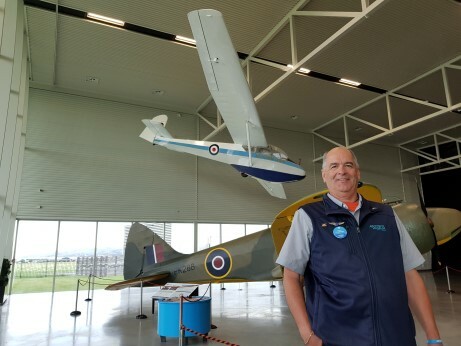 When he’s not working as a guide here at the Museum, Hans also volunteers as an ambassador at Christchurch International Airport, manning the help desks, and, like Thursday guide Ray Sheridan is a driver for Age Concern. When he’s not busy volunteering, Hans enjoys flying the impressive flight simulator which he built himself at home, complete with screens, switches and controls. He also enjoys flying radio control aircraft, and is a lifetime member of the Air New Zealand Flying Club and current Treasurer of the Air New Zealand Retirees Club. For ex-RNZAF Mechanical Transport (MT) driver, Mike Harrison, volunteering in the technical section at the Air Force Museum was top of the list when he retired – he was so keen, in fact, to be back amongst old mates, that he started here on his very first day of retirement, back in 2005. Mike joined the Air Force in June 1958 and did his recruit training at Taieri near Dunedin, not long before it closed as an RNZAF station. He did his basic driver’s course at Hobsonville, before being posted to Ohakea, and later, a requested exchange posting to Wigram, so he could be closer to his soon-to-be wife, whom he’d met on a blind date in Palmerston North. Wendy was from Dunedin, so Mike did a fair bit of commuting between Christchurch and Dunedin before they were married in 1963. During his more than 20 years in the Air Force, Mike recalls a number of standout memories, including a year-long stint at the Chief of Air Staff’s (then Air Vice-Marshal Douglas St George) personal driver, as well as being part of the RNZAF team that helped out following the Inangahua earthquake in 1968. His ultimate career highlight was a two-year posting to Tengah, Singapore, where he ran the transport section on No. 41 Squadron. He vividly recalls the time that the Prime Minister, Robert Muldoon, paid a visit and was introduced to the unit’s canine mascot, who was named after him. Mike remembers the PM not being overly impressed - “he just grunted and walked away”! After a terminal posting to Wigram, Mike retired from the Air Force in 1981 and went on to a succession of different jobs, the first of which was as a driving instructor for the Automobile Association, which he enjoyed immensely. He trained 1,000 students in the four years he spent in that role. Eventually, he ended up as a technical assistant in the Planning and Policy department of the Christchurch City Council, and it was from there that he retired on 7 June 2005. After 13 years as a volunteer, Mike still loves it here, and says it’s the camaraderie that he enjoys most – “It’s like being back in the Air Force, but without the uniform”. Most of his volunteer hours these days are spent helping out the Collections team; he is currently carrying out an inventory of the communications equipment in No. 3 Store with fellow RNZAF veteran, Bob McLellan. While he doesn’t come from a technical trade, Mike has an incredible talent for model engineering, with skills he has picked up over the years from watching others at work and giving things a go himself. He credits the Air Force with instilling in him “the greatest sense of learning” – always fascinated by how things work, he says he was lucky in his trade to have been exposed to a wide range of different people and skills, so he was able to pick up different bits and pieces wherever he went. Mike is a member of the Canterbury Model Engineers’ Club, and has a train (emblazoned with Air Force Museum branding! ), which he runs at the Halswell domain. He is also currently building a 5ft radio-controlled scale model of the British warship HMS Brave Swordsman, and has spent two years crafting two intricately detailed 40mm Mk.9 naval Bofors guns to mount on the model. 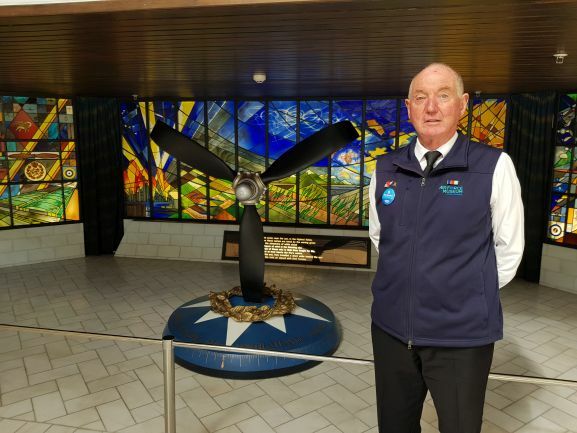 When he’s not at the Museum or in his own workshop, Mike is also the Secretary of the Canterbury branch of the RNZAF Association. With her background as a clerk in the NZ Army, Marylynne is perfectly poised to coordinate a wide range of administrative duties at the Museum, from running our busy Museum Headquarters reception, to liaising with our colleagues at Vbase. 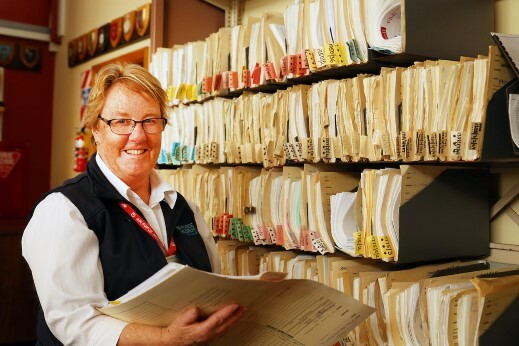 Originally from Dunedin, Marylynne began her long clerical career with a job at the Dunedin Traffic Department before going on to work at the Dunedin Public Library as the Admin Assistant (effectively, PA to the City Librarian). After seven years there, she made the decision to join the Army, entering service with the New Zealand Women’s Royal Army Corps in January 1977. This was just a few months before gender integration, which saw the separate women’s services disestablished and integrated into the regular armed forces. Following integration, she joined the Royal New Zealand Army Medical Corps, serving in the Clerical trade, mostly at Burnham. She had a short stint in Singapore in the early 1980s, but had actually been forced to leave the Army to go there, as they had cancelled her posting in favour of her then husband’s (a husband and wife couldn’t be posted together back then). It wasn’t long after she got back to New Zealand, however, that she was asked to join up again. When she eventually did leave the service, just as the Gulf War broke out at the end of 1990, she was once again hounded to stay on, but she wasn’t swayed, as it would have meant moving to Wellington. Stepping out of uniform didn’t meant the end to Marylynne’s Army career, however, and she stayed on in a civilian capacity right through until the position here at the Museum came up in mid-2014. Originally a maternity cover role, it extended into the full-time permanent position she now fills. Marylynne says she loves the variety that her job brings, with every day being different, and like everyone else here, it is the people that she enjoys most about working at the Museum. 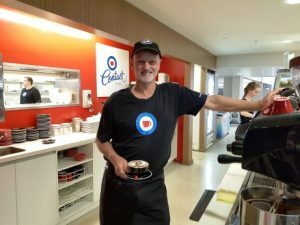 While they may be employed by Vbase, our Contact Café staff have become an integral part of our team here at the Museum, which is why we’re keen to include their stories in our ‘Meet our People’ profiles too. First up is Pete Nelson, commonly known as Pedro, whose official job title at our Café is ‘Barista A’ – in other words, he’s ‘the main man’ for coffee! While they may be employed by Vbase, our Café staff have become an integral part of our team here at the Museum, which is why we’re keen to include their stories in our ‘Meet our People’ profiles too. First up is Pete Nelson, commonly known as Pedro, whose official job title at our Contact Café is ‘Barista A’ – in other words, he’s ‘the main man’ for coffee! Pedro has been working for Vbase since 2010, and started here at the Museum in 2013. He’s lived and worked in a few different places over the years, from a stint as a dustman in his hometown of Wellington, to managing a ski lodge in Aspen, Colorado. He was married in Paraguay in South America, and speaks pretty good Spanish, which he’s always keen to practice with staff and customers! On their return to New Zealand, he and his wife moved to Whangarei, where Pedro embarked on his next challenge - being a stay-at-home Dad for their two children, to support his wife through further study. He said the first time round, in the late 1980s/early 1990s, ‘house Dads’ like himself were not all that common, and it could be pretty lonely at times without the support networks that existed for mothers. He noticed a distinct difference during the second time round, however, ten years later, when it had become more widely accepted, and therefore a lot easier. Pedro moved into the Café industry in the mid-1990s, when ‘Café culture’ in New Zealand was just starting to take off – he recalls that back then, ‘cappuccino milk’ would often be frothed in a microwave! He and his family moved down to Christchurch in 2010. They got to see ‘how beautiful Christchurch was six months before it came down’. But they have no regrets; he says it’s been a wonderful move, both for he and his wife, and for their two kids. ‘The people’ are what Pedro says he likes most about working here at the Museum. He loves interacting with visitors, and says it’s fantastic getting to know all the people who work here. He loves being part of this place, which he sees as ‘a living museum.’ In his down-time, Pedro’s a keen tennis player, and loves riding his motorbike, a 750cc Honda touring bike. He also enjoys catching up with the latest season of his favourite TV show, ‘The Walking Dead’. His favourite films are ‘Groundhog Day’, ‘Planes, Trains and Automobiles’, and ‘Dead Men Don’t Wear Plaid’. When Cliff Waites signed up as a volunteer back in 2005, he offered his services in not one, but two areas – both as a guide, and also as a volunteer assistant for our Audiovisual (AV) Technician, David Nicholson. With his background as an instrument assistant/avionics technician, Cliff is certainly well qualified for the latter! When Cliff Waites signed up as a volunteer here at the Museum back in 2005, he offered his services in not one, but two areas – both as a guide, and also as a volunteer assistant for AV Technician David Nicholson. He is certainly well qualified for the latter! 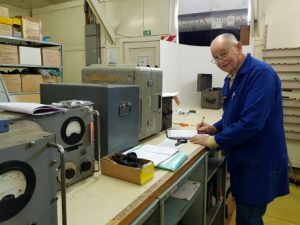 Cliff joined the RNZAF as a boy entrant in 1954, and went on to do his trade training at Hobsonville, qualifying as an instrument assistant, before also doing a Fitters and Mechanics course at Wigram. He spent much of the next eight years in uniform at No. 1 Repair Depot at Woodbourne, working on the rebuilds of the Harvards. He also had an exchange posting to Wigram, where, along with Devons and Harvards, he had the opportunity to work on the RNZAF Antarctic Flight aircraft and some of the US Antarctic Dakotas. Following his retirement from the Air Force, Cliff went on to NAC, where he continued his specialisation in aircraft instruments, becoming an avionics technician. 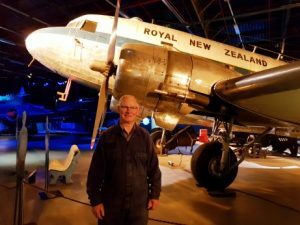 He spent 42 years with NAC/Air New Zealand, based in Christchurch, working on DC-3s, Friendships, Viscounts, and Boeing 737s, as well as time ‘in the workshops’ on electrical instruments such as auto pilot and flight director systems. He was also an on-call engineer, which regularly involved flying up to Auckland for overnight work, then back the next day. 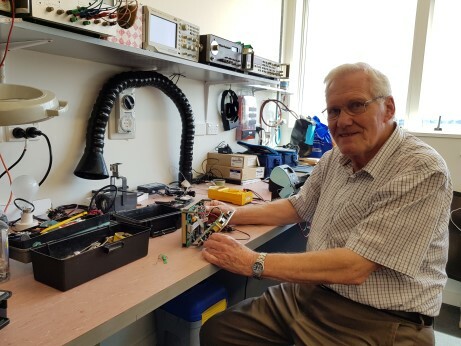 While he’s no longer serving as a guide, Cliff comes in once a week on Wednesdays to help David with any ‘odd jobs’ as required, including repairing test equipment and making up cables. He can often be found at work on a piece of equipment in David’s office, or accompanying him on tasks around the Museum. Once again, he says it’s ‘the people’ that is the most enjoyable thing about working here, and says everyone he meets is ‘friendly enough’. Given his former life, it’s perhaps not surprising that his favourite aircraft in the Museum are the Harvard and Dakota. Cliff’s a keen gardener in his spare time, and while he doesn’t have a favourite film, he is an ‘old time’ big band fan. When Emma Meyer (now Johnson) first started at the Museum as a collections technician back in February 2009, it was only meant to be for a few months’ maternity cover. Ten years and several different contracts later, however, Emma is one of our longest-serving Collections staff members, and an integral part of our team. As our Registrar, she is the first port of call for anyone looking to donate material to our collection. When Emma Meyer (now Johnson) first started at the Museum in February 2009, it was only meant to be for a few months, to cover the maternity leave of our then Collections Technician. Ten years and several different contracts later, however, Emma is one of our longest-serving Collections staff members and an integral part of our team. Emma was born in Christchurch and grew up on a sheep farm in North Loburn. Her path to becoming a museum professional began when she completed a Bachelor of Arts, majoring in History, at Canterbury University. 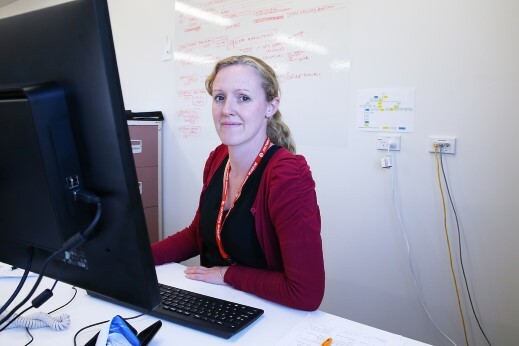 This led her on to Wellington, where she did a Master of Museum Studies at Victoria University and also her first paid museum job – a part-time archives assistant role at Te Papa. Then followed a series of practical placements at the Ministry for Culture and Heritage, Heritage New Zealand, Canterbury Museum and Christchurch Art Gallery, before she came here to the Air Force Museum. When her maternity cover role ended, Emma was engaged in another fixed-term contract, working on the first phase of our clothing store project, before taking up a temporary Assistant Registrar role at Southland Museum in Invercargill. When that contract ended just as the permanent Collections Technician role here became vacant, she jumped at the opportunity. The rest, as they say, is history, although she did have one more change when she took on the re-established role of Registrar in 2015. In her spare time, Emma enjoys spending time with family and friends, reading, watching Netflix, going for walks, and most recently, yoga. She also loves going to the movies, and her current favourite is Queen biopic, ‘Bohemian Rhapsody’. For more information on the process of donating items to our collection, click here. It was an encounter at a meeting of her local branch of the New Zealand Society of Genealogists over ten years ago which led retired librarian Evelyn Robertson to begin volunteering in the archives here at the Air Force Museum. It was an encounter at a meeting of her local branch of the New Zealand Society of Genealogists over ten years ago which led retired librarian Evelyn Robertson to begin volunteering here at the Air Force Museum. Our former Research Curator Vicky Garrington was giving the group a talk about the Air Force Museum archives, and Evelyn approached her afterwards to ask if she needed any volunteers. Upon hearing about her librarian background, Vicky snapped her up, and Evelyn began volunteering with the Research Team in 1 Store at the beginning of 2009. From Ashburton originally, Evelyn did her library training in Wellington. Her first librarian job was at Otago University in Dunedin, before she moved overseas with her husband Alistair, an electrical engineer. After four years in the UK they moved to Qatar in the Middle East for another two years, before returning to Christchurch. Evelyn then got a part-time contract at the University of Canterbury (UC) library. Beginning in 1988, she led a two-year barcoding project, which saw barcodes added to all books as a tracking mechanism. A permanent half-time cataloguing position followed, which included a three-year stint in the Psychology Department library. Evelyn retired in 2007, ‘early’, she said, so that they could go travelling while ‘still fit and able’. Evelyn and Alistair have spent three months of nearly every year since campervanning around the UK and Europe. Apart from the Winter months when she is normally overseas, you’ll find Evelyn helping out in our archives and research library on Fridays. Most of the work she does involves indexing (recording the contents) of magazines and periodicals in the collection, but she has also lent her librarian expertise to various other projects in our reference library. Evelyn also volunteers down the road at Archives New Zealand, and in her spare time, she enjoys gardening and tackling cryptic crosswords. 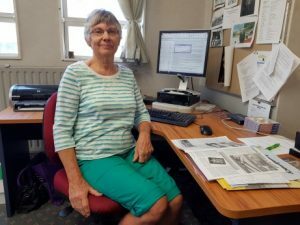 As indicated above, she’s also a keen family historian and has been a member of the Christchurch branch of the New Zealand Society of Genealogists since 2000. Evelyn loves the people here at the Museum, but she also enjoys learning ‘odd little snippets’ about things, and with her father having been a bomber pilot during the War, she certainly has an affinity with our collection; she has a particular soft spot for the Battle of Britain lace panel (currently in storage).